After 2 itinerary changes within a week before we left (one due to my brother’s schedule and one due to my screw up), we finally made it to Mexico. While most people going to Mexico are heading to a beach resort. this trip is about my mom and I visiting my brother who has been living in Mexico for almost 3 years. It’s been 2 years since he has come home for a visit, so last November my mom and I went to see him. We had a great time and decided to schedule a repeat visit. Last year we went to Merida, Mahuhual and Playa del Carmen. This time, we are going to Chetumal which is about 1 ½ hours from where he lives. After spending a few days together, he is heading back to work at Maya Palms Resort and we are going on to Belize for a few days. Just getting to Chetumal was an adventure. With a 6:05 AM international flight out of St. Louis, I woke up at 3:30 AM so I could be at the airport by 4:30 AM. Two flights, a ferry, a 4 hour bus ride and 2 taxis later, we made it to our hotel. Actually, the day went smoothly. Both planes departed on time and we had pleasant seatmates who we chatted with a bit. 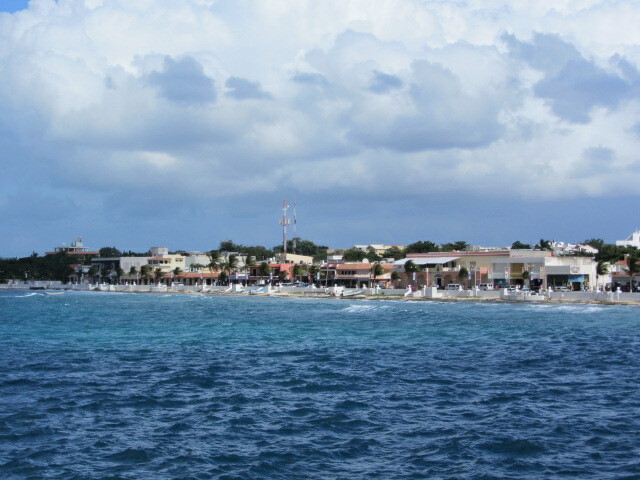 When we arrived in Cozumel, we took a 45 minute ferry to Playa del Carmen. I was looking forward to taking the ferry as I love boats big and small. Unfortunately, the seas were really rough and we were bounced around the entire way. You know it is going to be a rough ride when the crew starts passing out barf bags before they even pull away from shore. I survived. I did borrow the bag my seatmate had taken just in case, but luckily didn’t need it. With our feet back on land, my stomach settled quickly and I happily walked the 5 blocks to the ADO bus terminal to buy a ticket. We discovered our bus left from the other ADO bus station, so we grabbed a taxi across town to the station clearly aimed at residents, not tourists. No one spoke English, but we managed to figure out had to check our bags so we could take a walk in search of food. When we saw a pizza place that we ate at last year, we hit the jackpot. Two slices of pizza to-go later and we headed back to wait for our bus. ADO buses are nothing like the third world bus service you might expect from watching movies. These luxury buses are air conditioned and have bathrooms on board, sometimes making a few stops along the way where they pick up passengers and you can hop off to buy a taco to take back onboard. Our bus ride was non-stop, I got in a short nap between watching movies in Spanish and bought some empanadas from a roadside vendor the bus driver stopped at when he got hungry. We arrived in Chetumal after dark. After a long day of traveling we just headed straight to our hotel, Los Cocos. The next time you head to Mexico, consider looking for a destination beyond Cancun. Playa del Carmen, where we went last year for a few days is wonderful, and it is only a 45 minute bus ride from Cancun. Now that I know the buses are safe and comfortable, I will pick the city that sounds the most appealing rather than being limited to the cities with incoming international flights. The buses also give you the option to stay in a resort area for a few days, and then taking a day or two to visit one of the nearby towns with Mayan ruins. That said, I wouldn’t recommend taking the route we did unless you are staying for awhile in Belize. It was simply too much travel time for a short trip. Looking back on it from a few days later (I’m posting this trip a few days behind). I definitely think our original itinerary was smarter. Splitting the trip into two days would have made the whole experience more enjoyable. Don’t miss the rest of the trip. Sign up for RSS or email updates.